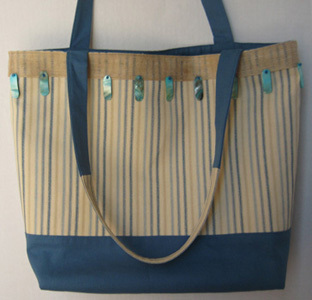 Bag is made of striped cotton canvas print w/contrasting solid blue canvas on lower portion of bag. Interior lined with blue cotton canvas. Magnetic snap closure. Inside pockets extend across the interior of the bag. Natural fiber ribbon trim with blue stone embellishments dangle from upper edge of bag.